The masked representative of San Sebastián Bachajón, Chiapas, describes in a Jan. 1 interview how residents of this Tzeltal indigenous community reclaimed the entrance to the Aguas Azules waterfalls on Dec. 21, 2014. Government officials at the tollbooth handed over the building without resistance to the non-violent indigenous movement led by the residents of San Sebastian Bachajon. Movement members set up an encampment at the tollbooth, where over one hundred people remained on guard at all hours. However on Jan. 9, 2015, several hundred state and federal police evicted them from the encampment to regain control of the tollbooth. This triggered a new series of confrontations with the movement in Bachajón. Currently the state has control of the tollbooth, but the movement has resolved to continue organizing to defend the tollbooth and their entire territory against state encroachments. 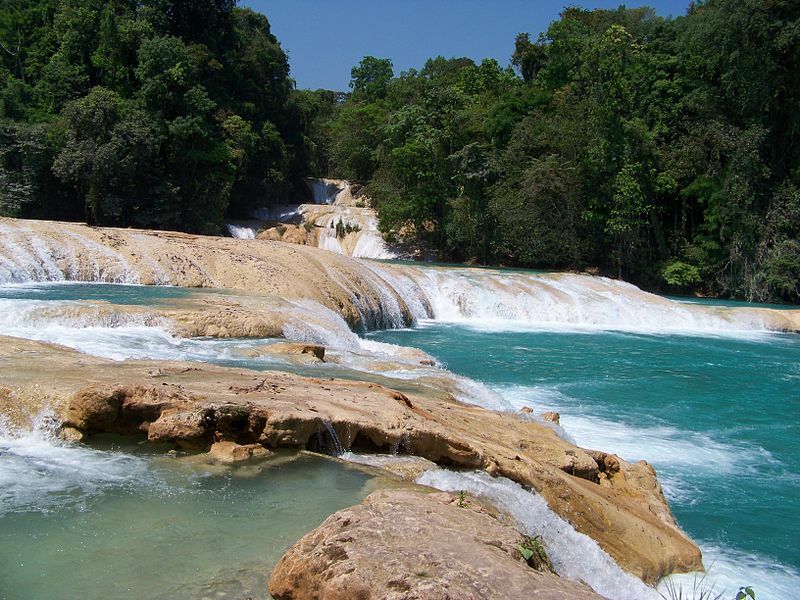 Bachajon’s territory borders the famous Aguas Azules (Blue Waters) waterfalls, a major tourist attraction in Chiapas. The local community has been fighting to maintain their territorial rights as an indigenous community against incursions by the state government, which intends to develop the site as an international tourist attraction. This regional strategy coincides closely with the Plan Puebla-Panamá, renamed the Mesoamerica Project, of which Chiapas is a pilot state. The development of Aguas Azules is part of the “Palenque Integral Planned Center”. The Center would include a luxury hotel at the waterfalls, an international airport in Palenque and construction of the Palenque-San Cristóbal highway. The development would bring immense environmental degradation, pollution, and land grabbing to the region. A hasty blockade of cut down trees on the road. For two weeks in December and early January, the Zapatista movement of southern Mexico, along with Mexico’s National Indigenous Congress and the adherents to the Sixth Declaration of the Lacandon Jungle, held the first ever “World Festival of Resistances and Rebellions.” Participants came from around Mexico and around the world. The movement in Bachajon adheres to the Sixth Declaration, a call the Zapatistas issued in 2006 to unite movements worldwide against neoliberalism and for autonomy in local communities. They took part in the Festival, which was inaugurated in Central Mexico the same day the movement in Bachajon reclaimed a part of their territory. They called for Festival participants to support their efforts for autonomy and encouraged alternative media collectives to visit the community. The battle for Bachajon did not begin with the latest conflict. Since 2006 community members have organized to reject the tourism development that forges ahead without respecting the basic rights of indigenous peoples to consultation and consent for projects in their territories. Due to these complaints, in recent months more community members have joined the resistance movement and no longer recognize the legitimacy of the local government, which acts in cahoots with the state officials who have violently attempted to take over the tourist site. While the government’s discourse insists that the conflict in Bachajon is an intra-community dispute in which the government serves as mediator, in the interview residents explain how the local, state and national governments have acted in collusion with sectors of the community. These actions not only justify the displacement of the community, but also the repression that has reinforced it. 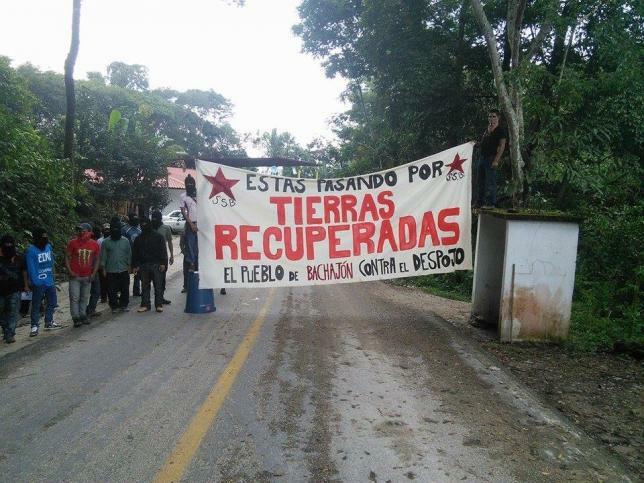 After ten days guarding the entrance to the community and the tollbooth, on January 9 at 6.30 am, more than 900 members of the state and federal forces violently evicted the encampment. During the attack, eight residents of San Sebastián Bachajon were apprehended and held without knowledge of their whereabouts for over eight hours before being released. After the eviction, ten police vehicles remained at the site to prevent a recuperation by the autonomous movement. 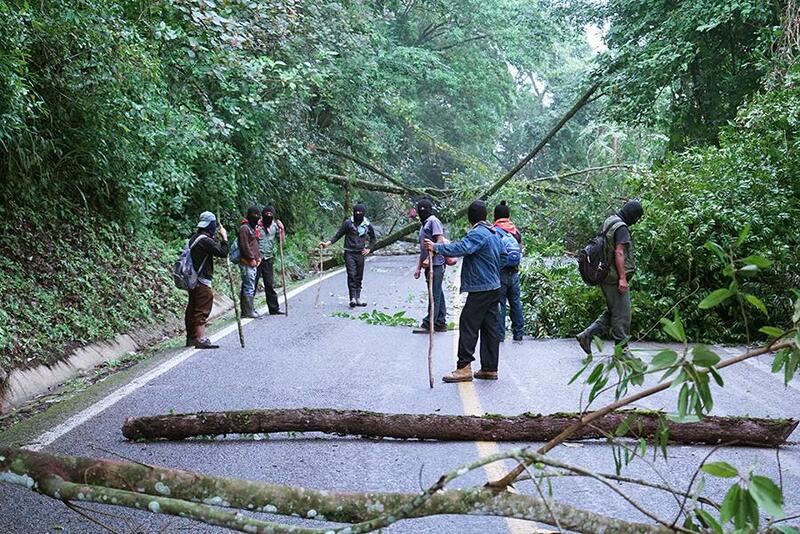 The next day, Jan. 11, the opposing group blockaded the Ocosingo-Palenque highway, one of the most important tourist and transit routes in Chiapas. When police arrived, the movement succeeded in driving them off with sticks, machetes, and slingshots. Meanwhile, the police shot back with rubber bullets and firearms. Only three residents of Bachajon were mildly wounded, but bullet casings scattered the highway after the attack. On Jan. 12, a police helicopter was spotted flying over the near-by community of Xanil. The occupants were taking photographs of houses below, making residents concerned more state or paramilitary attacks against movement leaders could follow. 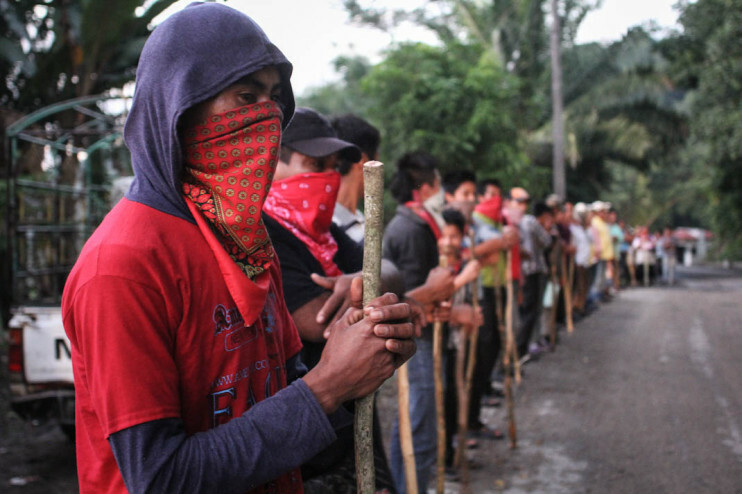 That afternoon, more than five police vehicles, with 160 officers, approached the blockade but were forced back by trees that the autonomous movement had felled to block the highway. Meanwhile, a paramilitary group under the direction of ejido authorities used an alternative route, effectively surrounding the blockade. While their presence did not lead to direct confrontation, ultimately the movement decided to lift the blockade. Since the blockade has been lifted, the autonomous movement in Bachajon has travelled to San Cristobal de las Casas, Chiapas, to provide information on recent events to solidarity organizations, and invited international observers to the community. On February 2, 2015, they announced the opening of a new regional centre for the Sixth Declaration in the community of Bachajon. January’s confrontation is not the first act of repression against the movement. State police and paramilitaries have violently repressed the movement for autonomy in San Sebastian Bachajon, in a strategy that has been characterized as low intensity warfare. The repression began in full in February 2011, when police descended on a community meeting, detaining 117 community members, all affiliated with the movement for autonomy. The government took over the toll booth and since then the total number of arrests has continued to grow. Of these 117, some were quickly released, while others spent months or more than a year in jail. The final two prisoners were not released until December 2013. Other former prisoners from the community are Miguel Vázquez and Antonio Estrada, both adherents to the Sixth Declaration, who were released in December 2014. The most recent unlawful arrests were on September 16, 2014, when Juan Antonio Gómez Silvano (whose brother Juan Carlos was assassinated), Mario Aguilar Silvano and Roberto Gómez Hernández were taken into custody. They are still imprisoned and report that they were tortured after being detained. Two members of the movement for autonomy have been killed, without charges being brought against the perpetrators. Juan Vázquez Guzmán was murdered at the door of his home on Abril 24, 2013 and Juan Carlos Gómez Silvano was killed on March 21, 2014. 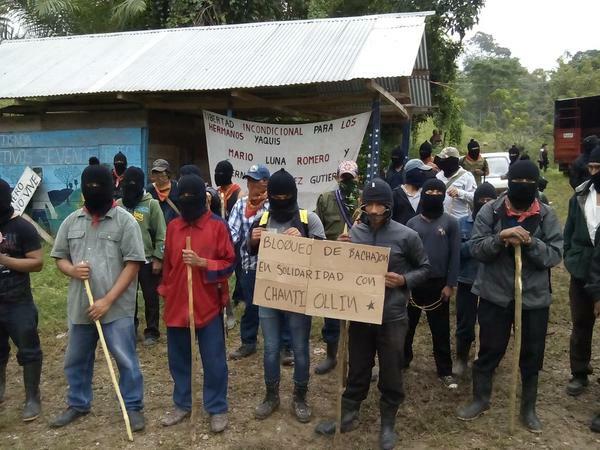 Community members say paramilitaries in the area murdered the campesinos and although a national and international solidarity campaign has called for justice, the cases have not been resolved. This repression is not a coincidence or collateral damage–it is an integral part of the tourism developers’ strategy. The Human Rights Center Fray Bartolome de las Casas (FrayBa) in San Cristóbal de las Casas, Chiapas, leaked documents from the U.S.-based tourism consulting company Norton Consulting and EDSA that recommend that, “The state and local government need to assure that the tourists who visit Chiapas and Palenque feel safe and protected” and that “the state needs to protect the developers and hotel operators from the perception of political instability”. These documents are reminiscent of the famous memo from Chase Bank in Manhattan, which stated that the Mexican government had to, “Eliminate the Zapatistas to demonstrate their effective control of the national territory.” The repression of social movements in Chiapas goes part and parcel with the efforts to development mega-tourism in the state. Aguas Azules (Blue Waters) waterfalls. On Jan. 1, the representative of the movement giving the interview keeps his face covered with a ski-mask for fear of violent retaliation for speaking up. The dense rainforest surrounding Bachajon lies in the heart of territory that the Zapatista movement reclaimed in 1994 from large-scale landholders. Their territory is close to the magnificent Mayan archeological site of Palenque and the waves of national and foreign tourism that descend on the region. Mayan culture, memorialized at Palenque, is alive and well in Bachajón. The residents of Bachajón, who speak the Mayan language of Tzeltal, defend their territorial rights so they will be able to maintain their livelihoods practicing subsistence agriculture. The representative explains that the people fighting to remain autonomous know as campesinos, or peasants, plans for a luxury hotel in their territory will not benefit them. The tourists who drive by the encampment do not look worried or scared as they pass local residents lining the highway with ski-masks covering their faces. Perhaps in the era of the state disappearance of 43 students from Ayotzinapa, Guerrero and the military execution of 22 in the town of Tlatlaya in June, the camouflaged trucks of the Mexican Army–a common site in Chiapas–provoke more fear than campesinos fighting for their livelihoods. Mainstream media typically describes the conflict as centering on the tollbooth, but the land recuperation that took place on Dec. 21 and the ongoing resistance reveals a much broader territorial vision. As one representative says, “We aren’t just concerned with the tollbooth. What we want is the land, because the land provides our food and is where we work to earn a living.” While the government once again controls the Aguas Azules tollbooth, the resolve of the movement for local autonomy has not flagged after more than seven years of struggle. Posted on February 10, 2015, in Defending Territory and tagged Bachajon, Chiapas, Indigenous Mexico, tourism, Tzeltal, Zapatistas. Bookmark the permalink. Leave a comment.